I absolutely love this dynamic writing duo! 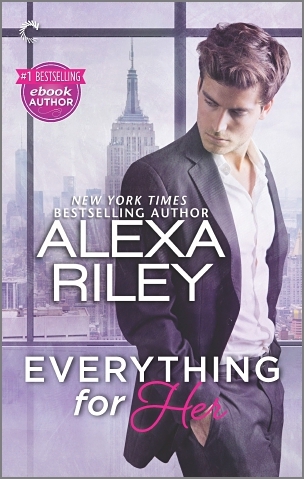 Whenever I need a fun, hot, smexy, over the top possessive alpha, I need to only look for an Alexa Riley book and I am in heaven! This story of Jordan and Jay is classic Alexa Riley! Jay is the feisty, take no prisoners assistant to Miles Osborne. (From their book Everything for Her, which I loved!) She is the epitome of a perfect heroine! Jordan, oh my Jordan! He is a computer guru at Osborne Corp. and the first time he sees Jay, he is “Claimed”. I loved the alternate POV’s! The special relationship surprise was fantastic! (I’m not gonna spoil it!) I enjoyed catching up with past characters from the previous books. The relationship with Jordan and his father was amazing. The angst and suspense in the book was spot on and just made me want to read faster! I really enjoy Alexa Riley’s stories, they are like a fresh French cruller (my favorite doughnut). I am hoping they write more books in this series, there are a few more characters I would love to know more about! If you love over the top, insta-love with possessive, obsessive, growly alpha heros, get this book you will enjoy just as much as I did!